In this January 6, 2016, file photo, Netflix CEO Reed Hastings delivers a keynote address in Las Vegas. 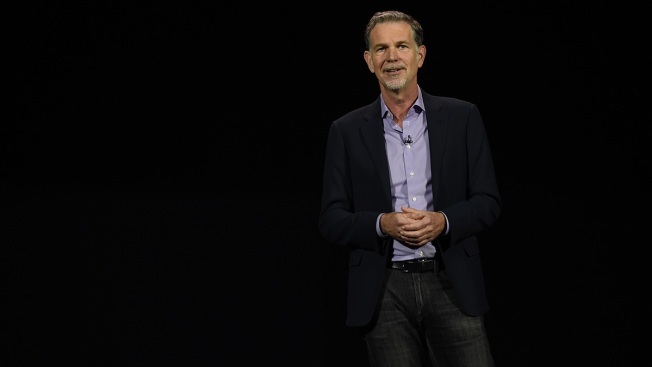 Netflix CEO Reed Hastings will not be nominated for re-election at the company’s 2019 annual stockholders meetings, Facebook said. Hastings has served on the Facebook board since 2011. Facebook said it will also not be re-nominating Erskine Bowles, and it will instead nominate Peggy Alford. Facebook on Friday saidNetflix CEO Reed Hastings will not be nominated for re-election at the company’s 2019 annual stockholders meetings. Hastings has served on the board of the social media company since 2011. The company said it will also not be re-nominating Erskine Bowles the president emeritus of the University of North Carolina, and it will instead nominate Peggy Alford, PayPal senior vice president of core markets. “Reed has served on the board since 2011 (8 years), and we thank him for his service,” a Facebook spokesman said in a statement. The addition of Alford, an African-American woman, comes as Facebook and other Silicon Valley companies strive for the inclusion of more women and minorities in their boards and throughout their workforces. Hastings' departure had been talked about for some time due to Facebook’s growing interest in video services, according to Andrew Ross Sorkin. In 2017, Facebook launched Watch, its video streaming service, and last year, the company released IGTV, its Instagram video streaming app. Hastings’ departure comes about three years after he got into a tussle with fellow board member Peter Thiel over their political leanings. In an August 2016 email, Hastings told Thiel that he planned to dock his performance review over his endorsement of then Republican Presidential-nominee Donald Trump, according to a New York Times report. Here’s what Americans would do with $5,000. The answers may surprise you.